Did some gardening clean-up on Sunday, as it was actually a sun-day. We had a wooden coal bunker (recycled shipping crate) that had rotted completely away. I’d been given a new crate by one of the truck drivers that comes in to load up daily, and it was finally a nice enough day to do the big swap. It was messy as hell, and when we finally got to the bottom and hubby was pulling out chunks of rotten wood, he gave a little screech and kinda…threw a chunk of wood toward me. “What is that?!? Ahhhh, it’s huge! What is it?! ?” He danced away from the remains of the box. Me being me, I turn the chunk of wood over and immediately let it go again when I see the biggest spider I have ever, ever seen in Ireland. This gal was Florida-sized. Cool, but I didn’t want to be bitten by a scared spider any more than he did. “I need a jar, quick!” I tell iDJ – and he gets me one but asks what I am going to do with it. So I did, and later transferred her to a plastic container so I could see her better. She was a little weak but after some time in the warm house (in the container) she’d perked up again and was spinning webs. I have a ‘complete Irish wildlife’ book which consistently fails to identify anything I can’t figure out myself. It’s frustrating. Two pages of spiders, really? I have more species than that in my own garden. Sheesh. Anyway, I took a photo with a measuring tape for scale, and let her go last night. Her new home is a nice old stone wall where no one walks and there are lots of nooks and crannies to hide in. That’s it I’m emigrating! 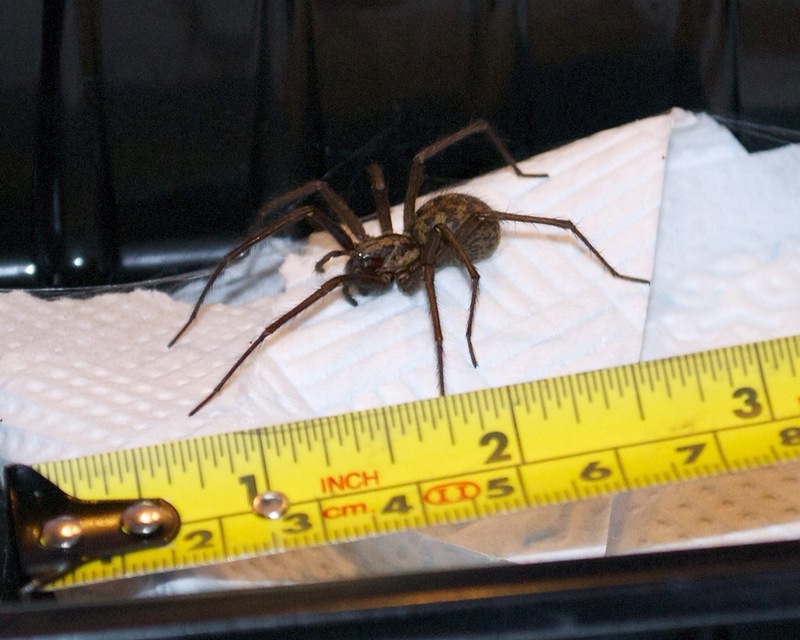 There aren’t supposed to be spiders that size in this country…. Do you think she came in with the shipping crate?…. Don’t think it’s a good idea to introduce her into the ecosystem, she might decide to breed…. If she did, it was on the old one that’s been sitting for at least five years! I don’t think they live that long. If she can find a fella of the same species, who am I to stand in their way? She’s not quite that big! Glad you guys are like me, and don’t squish first and ask questions later. Gorgeous! I want a dress made out of the pattern on her back! Thanks for taking care of her. Ooo, what an idea! She is pretty, like a tortoiseshell cat or a calico print. *shivers* I can’t stop staring at the hairs on her legs! Thanks for once more giving me a little bright spot to my day (even though spiders freak me out)! I didn’t touch her, as she was pretty perky after her holiday indoors and I didn’t want her running away in the house. Too tempting for cats and the dog, mighty hunters that they all are. So I don’t know if her leg hairs were spiky or soft. Usually their backs feel like velvet, though. A beaut. Props to you for not killing spiders. I consider them guardian spirits, even though there are some I’d prefer to have guard me at a distance. I had a jumping wolf spider that hung around the first floor for most of one winter — I’d look up and see it moseying along the ceiling. Nope, I like spiders a lot more than I like the things spiders eat, so they are always welcome! We let a lady and her eggs alone in the bathroom all last winter, and when they hatched just opened the window and they all found their way out. All several hundred of them, by the looks of it! OY! MUST LOOK AWAY. MUST RUN AWAY! Now…! That beast must have its own postcode. She might – if we had them in Ireland! Right now she’s just a resident of Cordarragh 🙂 I thought she was pretty… hubby just pats me on the head while smiling and nodding. When it is safe to do so, of course. Now that’s why we kick over – never pick up by hand – old wood/crates. We have black widows and brown recluses. This one must have hitchhiked in? Anyone know where the crate orginally came from? Will try to find pictures and identify – nice patterns. Spiders do a great job of bug hunting. We have a couple of DaddyLongLegs in the garage. We’ve no baddies here. They made a big fuss here recently about ‘false widow’ spiders, soon followed by the ‘fact’ a single great white might be heading to our shores. I swear, the Irish are terrified by anything they can’t eat. My dad tried to ID her, no luck so far! She might be an import, who knows. A very long-lived one, if so! And you think that it will stay there? I don’t know what kind it is but I’m sure it has fangs of death. Holy Cripes that’s a big spider. Glad there’s a computer screen between me and her. You were braver I would be to capture her. I read the Wikipedia page referenced in another comment. Interesting reading. I’m glad we don’t have these here!! Beside, I didn’t know spiders moulted. Makes total sense though, they are related to crabs. If they live long enough, yes they do. Not all species. Tarantulas do, of course – and you might have seen a skin or two left behind in a web from a smaller spider. Oh! I probably saw them and thought they were dead and decomposed spiders!